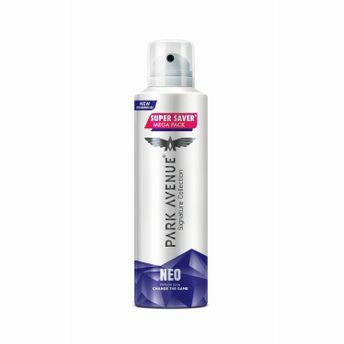 Change the game with Park Avenue Mega Pack Signature Deodorant Neo! Spray on the Neo blend of fougere and smell good all day. Its fresh and aromatic spicy notes will bring out the new you every-time. About the Brand: The Park Avenue Personal Care Range belongs to J.K. Helene Curtis Limited which is a part of the Raymond Group.The Park Avenue Grooming Range includes variety of Fragrances, Shaving Systems, Body Care & Hair Care Solutions for the grooming needs of today's man. Their Personal Care & Grooming products range have earned a reputation for being amongst the best in the industry.